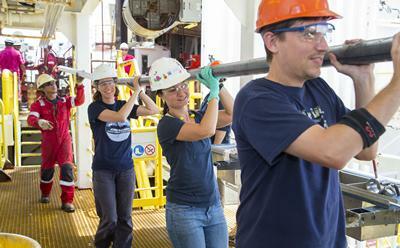 Professor Lisa McNeill, second from left, helps carry a core sample. During the expedition on board the research vessel JOIDES Resolution, the researchers sampled, for the first time, sediments and rocks from the oceanic tectonic plate which feeds the Sumatra subduction zone. A subduction zone is an area where two of the Earth’s tectonic plates converge, one sliding beneath the other, generating the largest earthquakes on Earth, many with destructive tsunamis. Findings of a study on sediment samples found far below the seabed are now detailed in a new paper led by Dr Andre Hüpers of the MARUM-Center for Marine Environmental Sciences at University of Bremen – published in the journal Science. The researchers found that the sediments on the ocean floor, eroded from the Himalayan mountain range and Tibetan Plateau and transported thousands of kilometres by rivers on land and in the ocean, are thick enough to reach high temperatures and to drive the dehydration process to completion before the sediments reach the subduction zone. This creates unusually strong material, allowing earthquake slip at the subduction fault surface to shallower depths and over a larger fault area – causing the exceptionally strong earthquake seen in 2004. 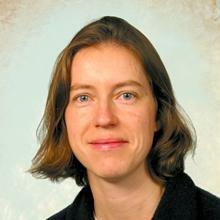 Dr Andre Hüpers of the University of Bremen says: “Our findings explain the extent of the large rupture area, which was a feature of the 2004 earthquake, and suggest that other subduction zones with thick and hotter sediment and rocks, could also experience this phenomenon.